I've been on a bit of a Frankenstein kick lately, Mighty Marvel style! I've been reading the Marvel Essentials THE MONSTER OF FRANKENSTEIN trade paperback and have to say I've really been enjoying it. I never had a chance to read these comics in their original format, which was published from 1973-1975. The original comic books were printed in color, but this book, as with all the Essentials line, is printed in black and white. This series, however, unlike Marvel's Tomb of Dracula series, really does work better in color, and it's a shame they haven't been collected together in that format. That said, it is still a great opportunity to enjoy a collection of stories that I otherwise probably never would get a chance to read. The book was originally titled THE MONSTER OF FRANKENSTEIN, but starting with issue #6 they changed it to THE FRANKENSTEIN MONSTER. The storyline continued despite the slight name change, which I doubt readers even noticed or cared much about it, truth to tell. 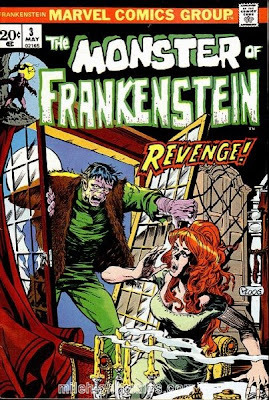 Issues 1 - 11 were written by Gary Friedrich, who kept the series fairly faithful to the source material, Mary Shelley's 1818 novel, Frankenstein. Doug Moench takes over the writing from issues 12-17, and the final issue of the original run was written by Bill Mantlo. Pencils and inks were done by Mike Ploog, John Buscema, John Verpoorten, Bob Brown, Jil Kane and Val Mayerik. The series was edited by Swamp Thing writer Len Wein. 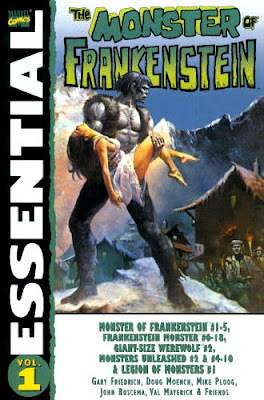 The main character is, as stated in the title, the Monster of Frankenstein. He is frozen in a block of ice and is found by a descendent of Robert Walton, the ship captain from the original novel to whom the story is told. The first couple of issues are basically Mary Shelley's novel told from the creature's perspective. It explains the monster's survival from the end of that novel and continues his further adventures. The early issues are really good, and the creature in these is a tragic character as in the novel, who is torn between survival and the need for human companionship, which he is forever denied due to his inhuman origin and hideous looks. This series started off strong, but kind of degenerated into a murky mess as it went along. Somewhere along the way the comic loses focus and the character changes from a sympathetic character to a super powerful killing machine bent on the murder of every member of the Frankenstein lineage. It was during the Doug Moench run of the series that the book jumps off track for me. The monster loses his ability to speak, which throws off much of his humanity. Perhaps he wanted to make the monster more like the Universal version. But with the loss of his speaking ability the monster also apparantly loses intelligence, and becomes little more than a super strong brute. He also becomes increasingly more powerful - where earlier in the series a single rifle blast almost kills him, he later becomes completely impervious to bullets. The monster is brought into current times during the Moench run by means of being frozen in a block of ice (for the second time). The book runs even more off track for me at this point, as he is really out of place in modern soceity and the monster's motivation become even more muddled. He is just a dumb brute, and little of the humanity that makes him so appealing early on exists in the later creature. Despite all this, I have to say I am still enjoying the series. I am about three quarters of the way through the book, and look forward to finishing out the series. Included in this collection are the original series issues 1-18, GIANT-SIZE WEREWOLF #2 (a crossover issue), and stories from MONSTERS UNLEASHED #2 and #4-10 which all feature the Monster. Turning attention toward a newly added cate-GORY in last year's Rondo Awards, my choice for Best Classic DVD Collection would be the Icons of Horror Hammer Films collection. 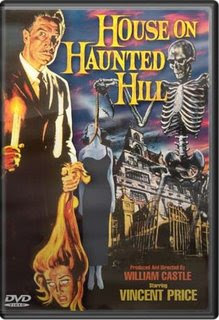 It features four movies never before released on DVD - The Two Faces of Dr. Jekyll, The Gorgon, The Curse of the Mummy's Tomb, and Scream of Fear. 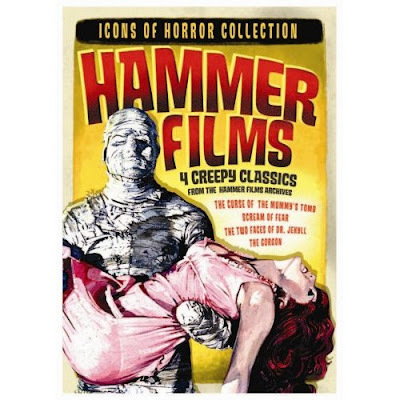 It's a great 4-pack of Hammer Horror fun - and it's my choice for BEST CLASSIC DVD COLLECTION. It's by no means a complete list, just some of the ones I felt were deserving of possible Rondo inclusion. Looking at the above list, I have a hard time narrowing it down to just one choice. I almost chose Cloverfield (it comes in a close second for me), but I have issues with that movie. My number one beef with it is the camera work. I understand that the hand held look is because we're seeing the action through a video camera held by a scurrying survivor of this devastating event (a giant monster invasion), and we're watching the events unfold first person as it happens. It's a great idea, but the problem lies in the execution. I felt the filmmakers had little respect for the viewer in this area - the whirling, shaky, constantly moving camera movement was way overdone, and in fact I literally felt nauseous watching it, (and even had to turn away from the movie at one point due to motion sickness). This constant camera motion also became distracting to the point of pulling me right out of the story.Instead of being swept up in this gripping event I was constantly annoyed at the camera work. For an example of how this technique can be used properly check out Diary of the Dead. 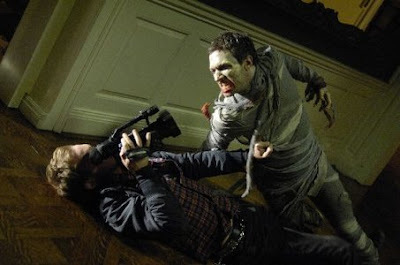 The lead characters in this film are also on the run in the face of a disaster, a zombie plague in this case, and we're seeing the action through the lens of their video camera, too.This film manages to pull off the same effect without the nausea inducing overuse of Cloverfield. I didn't think it was as good of a movie as Cloverfiled, but I did at least appreciate Romero's restraint on the hand held technique. The Dark Knight was a good film, and featured an amazing performance by Heath Ledger as the Joker. But although I liked the movie, I didn't feel it was the best picture of 2008. 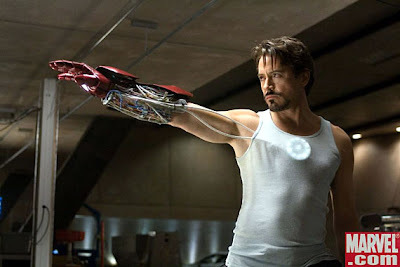 My choice for Best Movie for 2008 has to go to Iron Man. It was a near perfect comic book adaptation, and really hit a home run in my book.Fantastic special effects, great casting and acting, and a fun storyline. I grew up an avid Marvel comics reader, and for me it really held true to the source material. It was as if the pages of a comic book had come to life. I had my doubts going in whether they could convincingly pull off the armor effects, but it was really well done.Robert Downy Jr. was fantastic as Tony Stark, and Jeff Bridges was a perfect villain. I liked the always lovely Gwyneth Paltrow as love interest Pepper Potts too.It was just a really entertaining movie, and in my opinion the best of 2008. So it gets my vote for Best Movie in the 2008 Rondos! January 19, 1809 is the birthdate of Edgar Allen Poe. He would have been 200 years old this year, and I just wanted to take this time to pay homage to this great American author. Happy birthday, Edgar! The 7th annual Rondo Awards are just around the corner, so I thought I'd spend the next few days going over some of my personal endorsements for this year's awards. First up I'll take a look at Best DVD Company. 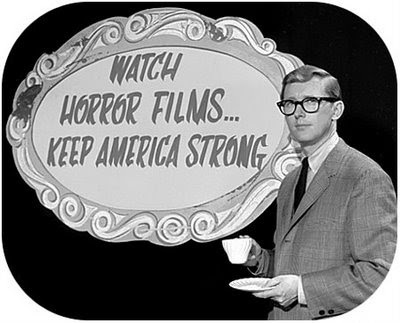 Alpha Video has done more to keep classic horror alive than most video companies out there. People who are willing purchase expensive films from companies such as Criterion, for instance, are genre fans – they would buy these movies regardless of the price. It’s the non-genre fans who are paid the biggest service from Alpha Video, and that is exactly the way in which Alpha is helping keep classic horror alive. Now don’t get me wrong – I LOVE many of the films that companies like Criterion put out. They have a really terrific selection of DVDs. I just am not going to spend 30-40 dollars on movies like THE BLOB, or FIEND WITHOUT A FACE, as fond as I am of those movies (and believe me, I really, really like both of them). As much as I might like to buy these, I am a father of three boys, and my discretionary income for DVD purchases is severely limited. 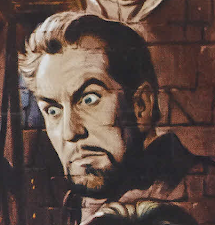 I won’t buy a $40 DVD, but I might just pick up a 5 or 6 dollar print of something like NIGHT OF THE LIVING DEAD, THE HOUSE ON HAUNTED HILL, SHOCK with Vincent Price, REEFER MADNESS, or any of a number of the fun films from their catalog. And I know there are many people out there just like me, folks who might otherwise not even think about buying an old horror movie, but for five bucks, why not? 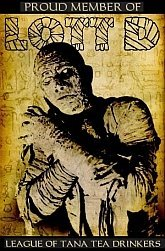 Alpha has a terrific selection of movies in a variety of categories: Horror, Sci-fi, Exploitation, Serials, Silent Movies, old Television series, and more. Plus they’ve started distributing some newer material such as Mark Redfield’s terrific DR.JEKYLL & MR. HYDE, (which I highly recommend). Their covers are really top notch, and really make these DVDs stand out on the shelves. So for these reasons I’m voting for Alpha Video for DVD Company of the Year in the Rondo Awards again this year. Good luck Alpha, and I hope all of you out there vote in the Rondo Awards this year. A resolution recognizing the contributions of The Go Green With Dr. Gangrene campaign, New Valiant Productions, and WNAB CW 58 Creature Feature for their faithful service in the best interest of the City of Nashville Tennessee and Davidson County. WHEREAS, it is fitting and proper that the Metropolitan Council recognizes Mr. Larry Underwood, Ms. Linda Wylie, Mr. Cameron McCasland, and Mr. Michael Creason for their distinguished careers and wish them well on their future projects. Section 1. The Metropolitan Council hereby goes on record as recognizing the contributions of The Go Green With Dr. Gangrene campaign, New Valiant Productions, and WNAB CW 58 Creature Feature for their faithful service in the best interest of the City of Nashville Tennessee and Davidson County. Section 2. The Metropolitan Council Office is directed to prepare a copy of this Resolution to be presented to Mr. Larry Underwood, Ms. Linda Wylie, Mr. Cameron McCasland, and Mr. Michael Creason. 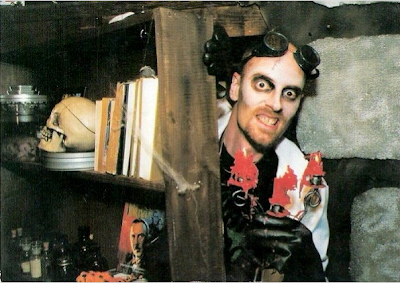 A pioneer of the horror host industry passed away yesterday - Bob Wilkins. Bob is best known as the host of Creature Features, a show that ran from 1972 - 1981 in the San Francisco Bay area. Bob got his start, however, in the Sacramento area, where he worked as a weather man. He hosted a show there called Seven Arts Theater before moving to the Bay area. He even did a stint in the 70s as a kids host known as Captain Cosmic. The neat thing about Bob is that he was a non-costumed host. He wore a suit and tie and hosted the show from a set that resembeled a run down house. He sat in a rocking chair and introduced the shows in a low key manner. Best of all, he interviewed many of the stars from the Hollywood films he showed, a perk to hosting a show in California. Among his guests was Leonard Nimoy, William Shatner, Forrey Ackerman, Ray Harryhausen and Christopher Lee. For more information about Bob go to www.bobwilkins.net. There is even information there about where to send condolences to his family. Ran across this the other day and thought I'd share it here. 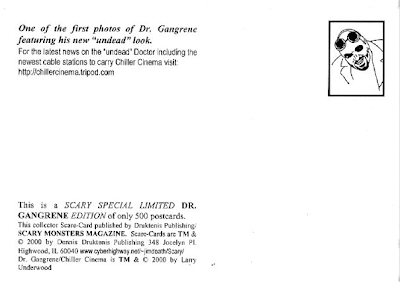 It's a limited edition card Scary Monsters Magazine put out - it came in the limited edition Dr Gangrene special of Scary Monsters # 36. From time to time I think I'll toss some of the different photos and other assorted goodies on here that I've collected over the years. "Here's to a new world of Gods and Monsters"